The Bureau of Land Management (BLM) is an American federal agency responsible for taking care of wild horses on public land. The BLM also divides land resources among competing interests like mining, grazing, tourism, and energy. 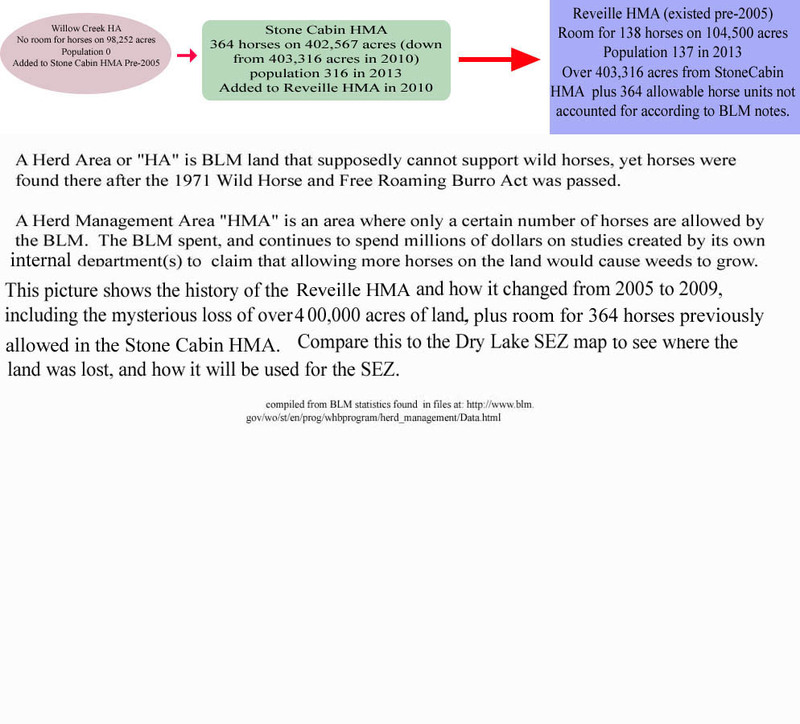 Wild horse advocates claim the BLM is acting in an inhumane, biased, and illegal manner towards wild horses. Right now, wrong information is leading to serious criminal violations and other issues. This article is the first of a series attempting to bring out the truth and help us all work towards the goal of doing what is best for the horses and our nation. Starting this October, the BLM will round up "excess," "nuisance" horses from the Silver King, Triple B, Reveille, and Eagle Herd Management Areas (HMAs). Did you know the BLM is also saying that wild horse mares are giving (what must be) a virgin birth to three to five foals at a time? 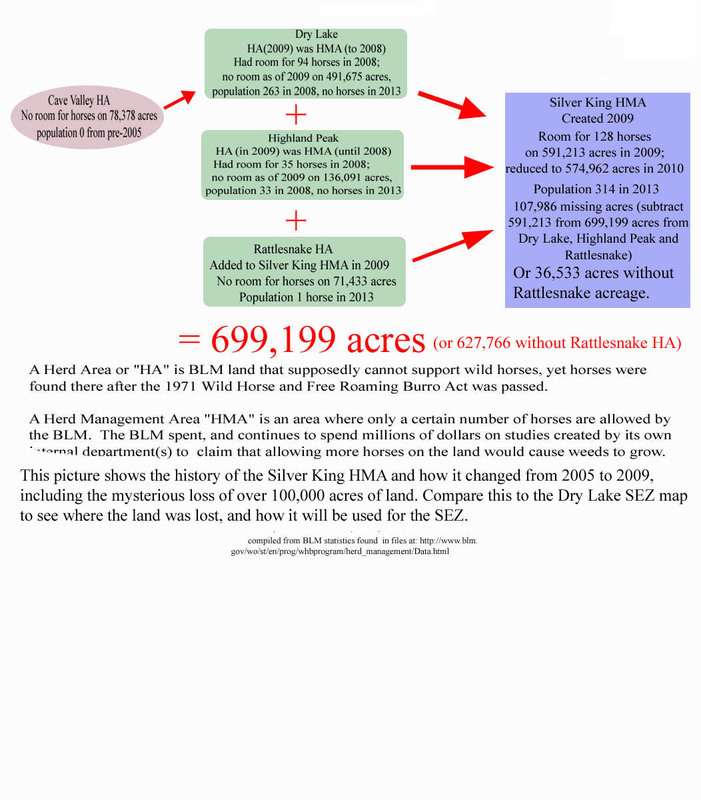 For example, from 2007 to 2008, BLM Nevada numbers for the Dry Lake/Silver King herds show the population went from 75 to 263 animals. Then, the Pancake/Triple B herds went from zero horses in 2009 to a whopping 1,076 horses in 2010! 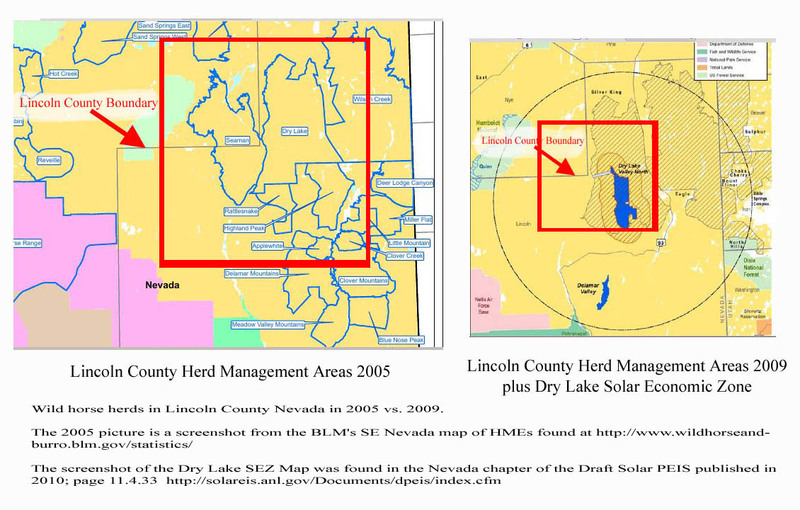 Were it not for the fact that these "population increases" trigger horse roundups to stop the "weed problem", perhaps we could overlook the fact that these herds are conveniently in the Dry Lake Solar Economic Zone (SEZ). The Colorado River Commissions of Nevada leased former federal lands in the Clark County Nevada HMA region to Techren, a client of the law firm Reid's son, Rory worked for. The Zephyr (Transwestern) Transmission Line is also partly developed by Techren, and a prime reason for roundups in multiple states from Wyoming to Nevada. Various leaders passed laws that force private businesses to buy or create carbon credits. These companies lease government land to build solar and wind power plants using stimulus funds and taxpayer money. 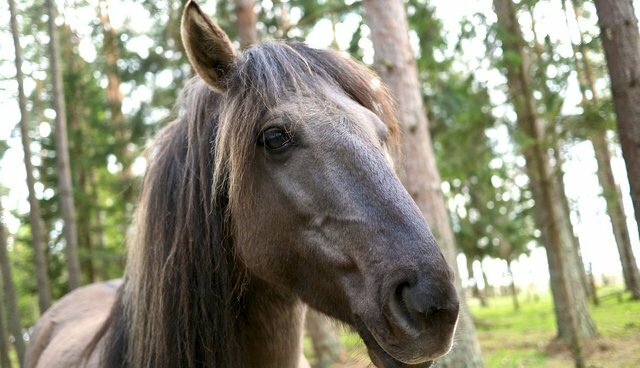 The horses would not be removed from public land if the government wasn't looking to lease the land to companies that will develop solar on the land. Former BLM director and proponent of multiple land use doctrines, Kathleen Clarke, told ranchers to sue the BLM over "excess wild horses". 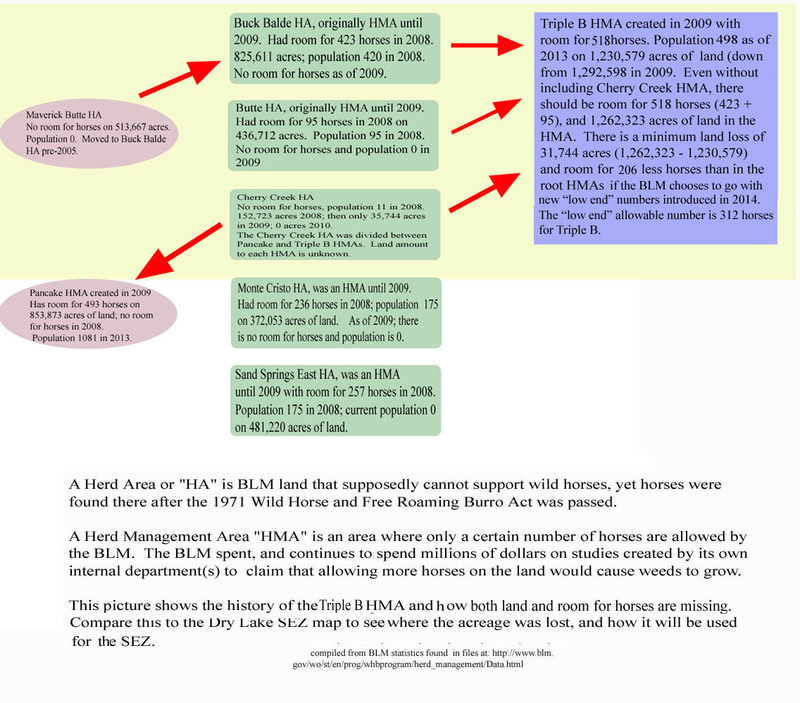 Herd information on the BLM website says wild horses stem from animals abandoned by ranchers. Thus, ranchers using 80 percent of federal grazing land dump off horses and demand round ups so that solar and wind operations get more land. Along with biased studies, government business needs legal precedence in court cases won against "excess" wild horses to justify getting rid of cattle later on. Right now government business and leaders favor solar power over horses. It is insane and biased to use taxpayer money to fund research that genuinely believes a single wild mare produces three to five foals a year. Yet, government business uses these studies to "prove" there are too many horses. 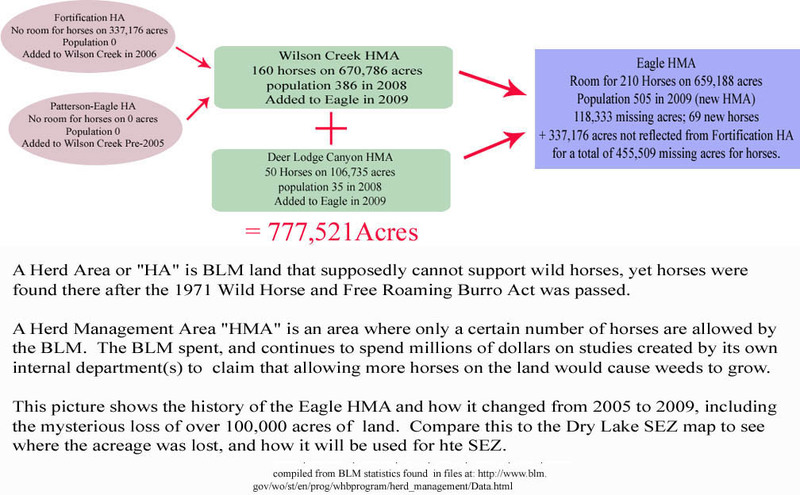 Then, the BLM admits cattle ranchers or government business with a vested financial interest in the land can dump off animals, recategorize Silver King, Eagle, Reveille, Triple B, and other HMAs, or use different methods to inflate native horse populations without getting caught. Senator Reid and his associates are responsible for obscene roundups during the course of doing government business. We do not have to stop developing solar power because of wild horses. We do need to stop marginalizing wild horses and use more humane methods to achieve our national goals.